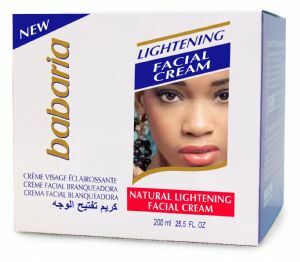 The Babaria laboratories have developed this hydroquinone free cream based on aloe vera and alpha hydroxy acids, which have exfoliating properties that help eliminate the pigmentation which gives skin its colour after exposure to the sun. It also leaves your skin softer and more moisturised and has a solar filter to protect it from the sun's rays. Aqua (Water), Stearyl Alcohol, Glycerin, Ethylhexyl Methoxycinnamate, Isopropyl Myristate, Cetyl Alcohol, Ceteareth-20, Ceteareth-12, Polyacrylamide, Butyrospermum Parkii Butter. Aloe Barbadensis Leaf Extract, Glycolic Acid, Methylisilanol Mannuronate, C13-14 isoparaffafin, Dimethicone, Laureth-7, Ascorbic Acid, Phenoxyethanol, Triethanoamine, Parfum (Fragrance), Sodium Methylparaben, Methylparaben, Citric Acid, Tetrasodium EDTA, Butylparaben, Ethylparaben, Propylparaben, Sorbic Acid, Potassium Sorbate, Sodium Benzoate, Sodium Sulfite, Hexyl Cinnamal, Geraniol, Citronellol, Alpha-lsomethyl lonone, Limonene, Coumarin, Linalool, Butylphenyl Methylpropional.